A former Uber driver and Federal Protective Services officer was sentenced Tuesday to five years in prison for killing another driver while driving drunk in May 2015, the Montgomery County State's Attorney's Office said in a statement. Juan Francisco Diana, 35, of Silver Spring, Maryland, was sentenced to 10 years in prison with all but five years suspended for the crash that killed 50-year-old Diane Corrao of Gaithersburg. Diana will also serve five years of probation, during which he cannot consume alcohol or drugs and he will have an ignition interlock installed on his car. "Two lives were forever linked and two families were forever changed," said Ramon Korionoff, the State's Attorney's Office Public Affairs Director. "A fatal car crash ended the life of Diane Corrao and started the struggle for Juan Diana." 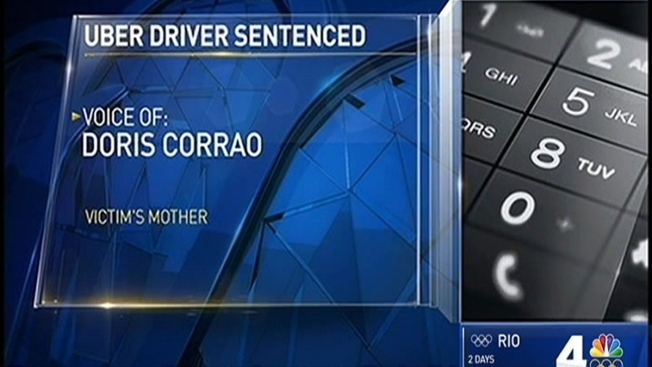 Corrao's mother went to court Tuesday morning for the sentencing, where photos of the crash scene and her daughter's body were among the evidence. "I had to do it for my daugher," Doris Corrao she said. Diana was driving his black 2014 Ford Fusion an estimated 84 mph -- with a blood alcohol content level of 0.10 percent -- on Muncaster Mill Road near Rockville the night of May 31, 2015. The road has a posted speed limit of 40 mph. He crossed the road's double yellow lines and slammed head-on into Corrao's Ford Taurus. A 911 call from another driver was part of the evidence against Diana. "There was a black car that flew by us and ran the red light, was driving like incredibly recklessly, speeding very fast, and that was the black car that was involved in the accident," the caller said. "One car, white, the victim's, one car, black, the defendant's," Korionoff said. "A stark contrast where one family will have the shadow of darkness forever hovering over their heads while one hopes a shining light of redemption can overcome this tragedy of death at the hands of their loved one." Diana was off-duty for Uber that night and did not have a previous record. "This [sentence] will hold Mr. Diana accountable and give him time to think about his actions on that late May night in 2015," Korionoff said. Corrao left behind a husband and daughter who is now 12 years old.